Type species Paramesius rufipes Westwood, 1832, by monotypy (secondary homonym of Teleas rufipes Fonscolombe, 1832) = Paramesius belytoides Marshall, 1867 (suggested here). For the diagnosis of the genus, see Macek (2001) and Masner & García (2002). Taxonomic remark. 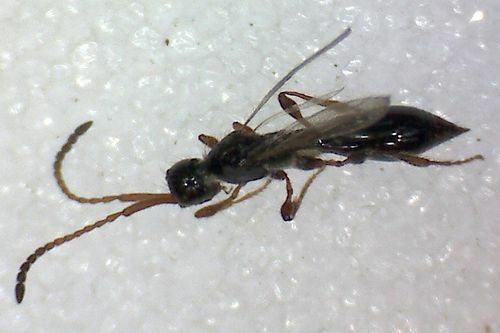 The type species name P. rufipes Westwood was preoccupied by P. rufipes (Fonscolombe, 1832), the description of which had been published two months earlier (Fergusson, 1977). 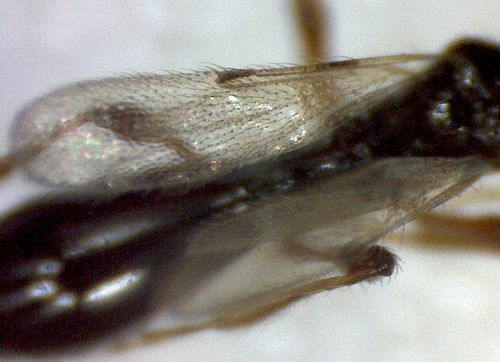 Dessart (1966) defined P. rufipes (Fonscolombe, 1832) as a senior name to P. elongatus Thomson, 1859, and this synonymy is confirmed here. Fergusson (1977) replaced the name P. rufipes Westwood (as a junior homonym) with P. westwoodi Fergusson, 1977. 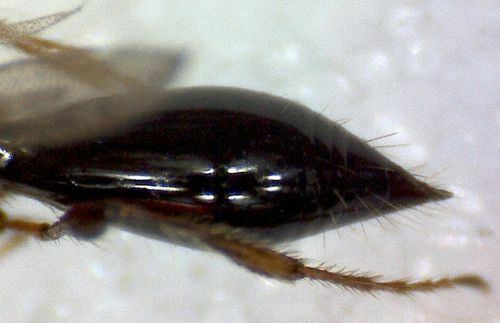 However, Macek (2001) suggested using the names P. rufipes Westwood and P. elongatus Thomson “ because P. rufipes Westwood is the type species of the genus Paramesius with type specimen preserved in OXUM, in contrast to obscure Paramesius (= Teleas) rufipes (Fonscolombe, 1832), the type of which is lost ” (Macek, 2001). This proposition contradicts to the ICZN (1999), and the type Paramesius (= Teleas) rufipes (Fonscolombe, 1832) is actually kept at MNHN (Paris, France) (Notton, 2004). 3. Mesopleuron ventrally with reticulation ( Fig. 27 ); propodealal spiracles large, its height only 4.0 times shorter than length of propodeum in lateral view ( Figs 28, 29 )… P. spiracularissp. nov.
- A 12 in dorsal view transverse or subquadrate ( Figs 37, 42 ), notauli complete and deep throughout… 6 with a few solely long setae (Fig. 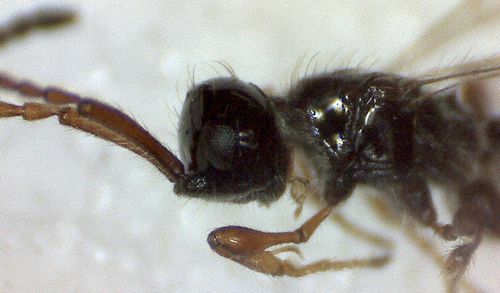 26)… P. rufipes (Fonscolombe) - Notauli deep anteriorly with sharp margin throughout (Figs 14, 16, 22, 23); pronotal cervical area with numerous short and long setae (Figs 15, 17)… P. primorussp. nov.
6. Pronotal cervical area with two lines of short furrows (Fig. 19); anterior scutellar pit weakly transverse, 1.7–1.6 times wider than its length, with one keel (Fig. 18)… P. janmacekisp. nov.
- A13 1.15–1.38 times longer than A12 and A11 together ( Fig. 33 ); mesoscutal suprahumeral sulcus full and deeply sculptured at bottom (Fig. 22)… P. ocampussp. nov.
3. 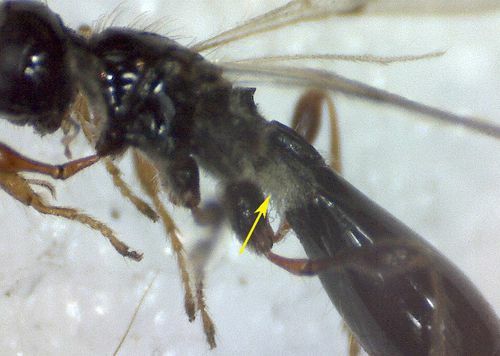 Mesopleuron ventrally with reticulation and with keel extending from anterior to median coxae ( Fig. 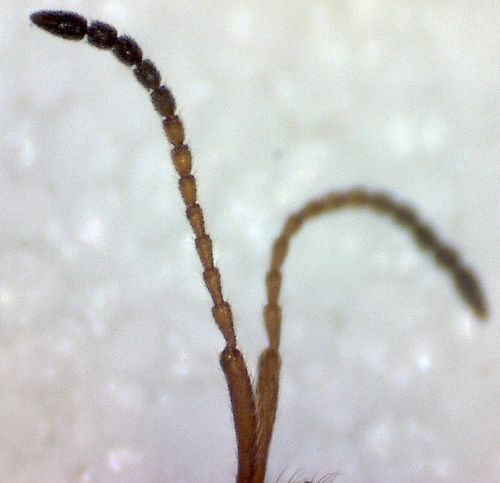 27 ); propodeal spiracles large, its height 5.0 times shorter than propodeal length in lateral view ( Fig. 31 )… P. spiracularissp. nov.
4. Pronotal cervical area high with two lines of short furrow (Fig. 19)… P. janmacekisp. nov.
6. A4 with keel extending to 0.55–0.60 of its length (Figs 46, 51); mesoscutal suprahumeral sulcus complete and deeply sculptured at bottom (Fig. 22)… P. ocampussp. nov.
7. Occipital flange foveolate ( Fig. 11 ); pronotal cervical area with numerous short and long setae (Figs 15, 17); notauli deep, anteriorly with sharp lateral margin (Fig. 16)… P. primorussp. nov.
Hymenoptera Online Database (2009) Hymenoptera Online Database.